At the Consumer Electronics Show in Las Vegas last January, Samsung showcased a smartphone with a curved screen. That smartphone is now set to make its bow this October, as Samsung launch their Apple iPhone 5S fightback. The Samsung fightback began in Seoul last Wednesday, where D.J Lee – the head of strategic marketing in Samsung’s mobile division – delivered a keynote speech to launch the new Samsung Galaxy Note 3. Lee was uncharacteristically coy in his presentation, providing almost no details about the new device. That has only stocked the internet rumors, with Engaget reporting that Samsung will launch a curved screen device which will be ‘totally flexible’. Such rumors have been abound before – most noticeably around the iPhone 6. Around July time rumors were flying around that the new iPhone would be the 6 rather than a 5S, on the assumption that Apple might shun the ‘S’ iteration on the back of its negative perception as an unevolved and largely unimproved device. Apple, its perceived, save their big updates for the new number, rather than the ‘S’ which is seen as an update. Of course history tells us that the September iPhone launch was in fact for the iPhone 5S, a device which has gone on to break all records for Apple, but that’s not to say that the company have shunned their ideas around a curved screen. Such is Apple’s planning cycle, that you wouldn’t bet against the iPhone in the below post indeed being an iPhone 6 prototype. What we do know is that Samsung are looking in this area. 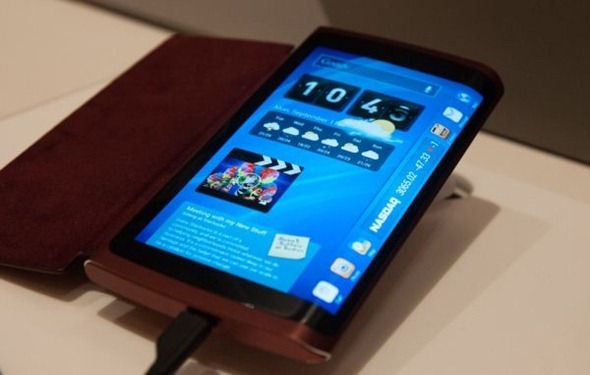 This was amply evidenced at CES where they showcased their ‘Youm’ curved smartphone. That’s going back over nine months, and the company will have been furiously working on this design feature. As smartphones become more and more important in our lives, designers are trying to maximise the amount of display real estate that users get without having to create ginormous devices. Some have gone off on the deep end, creating ‘phablet’ devices with accompanying ‘old-school’ style companion phones, others are looking at features like curved screens, which utilise more of the device minus the bulk. The 5S has also forced Samsung’s hand, with the feeling now being that it is their turn to launch something a bit special. In many ways, the 5S has not delivered much on top of what Apple already had, but the radical overhaul of their operating system bringing a whole new feel and new features, alongside the launch of the new iPhone with a fingerprint scanner, Apple have managed to make this ‘S’ iteration feel fresh and exciting. They have achieved this to such an extent that the new device has broken all of their records, including the queue size outside their flagship store, units shifted in the first weekend and stock sell out rates. Their new ‘gold’ model is so scarce that its selling on eBay for £2,000. Before this release, we felt it was make or break for Tim Cook, Apple’s CEO. Cook needed a big hit to show that the company can innovate beyond Steve Jobs, and this has done much to overcome those doubts. The markets and perception is thickle, and Cook new as much, playing it all to his advantage. The Apple PR machine around that launch has been immense, really compounding the Apple feel good factor. Samsung can now regain some of their initiative, and a curved smartphone may just deliver that. So watch out for their October release, and we’ll bring you all of the updates as they come through. Read: Are Google planning an ‘Apple style’ retail chain?